It’s hard for most of us to imagine becoming a professional golfer at age 17. Yet Matteo Manassero’s grip on his young career – like his hold on the club – seems rock solid. The Italian prodigy, who turns a wizened 22 in 2015, has been a fixture on the European Tour since his 2010 pro debut. In fact, he won tournaments in each of his first four seasons. Slightly built by 21st-century standards, the 5’11”, 164-pound golfer isn’t a long hitter. But he gets by on accuracy and uncanny putting – a combo rooted in his grip styles. First, the full swing. Manassero differs from many young players in that his grip isn’t super-strong. 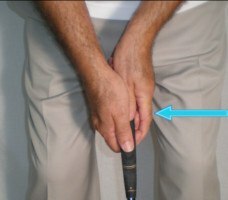 Yes, his left hand is in a mildly strong setup, with the palm turned toward his right. But Manassero’s right hand assumes a classic neutral placement: “V” between thumb and index finger aligned with the club’s handle, a small cup formed at the wrist. 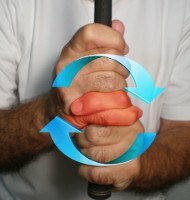 Manassero’s “mixed” grip – so called because it marries strong and weak or neutral positions – puts him in good company. 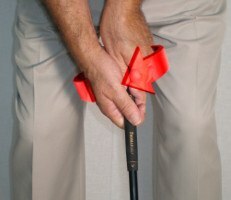 Two-time major champ Angel Cabrera employs a similar style. When it’s time to cash in all his greens in regulation, Matteo Manassero’s grip with the putter is money in the bank. His hands are extremely relaxed, united by a traditional reverse overlap arrangement, the palms facing each other and arms hanging comfortably from the shoulders. From here, Manassero makes an effortless, back and through motion that could serve as a model for the arms and shoulders method.